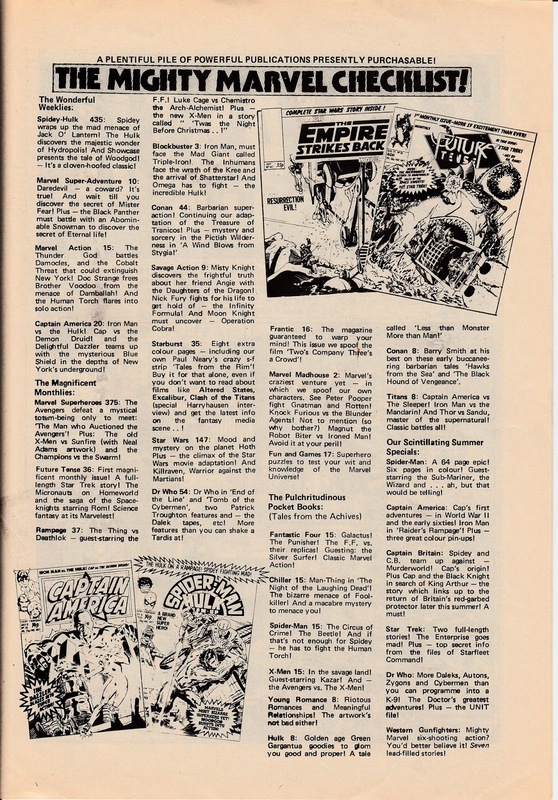 Here's what a truly devoted British Marvelite should have been buying from the British Bullpen in July 1981. 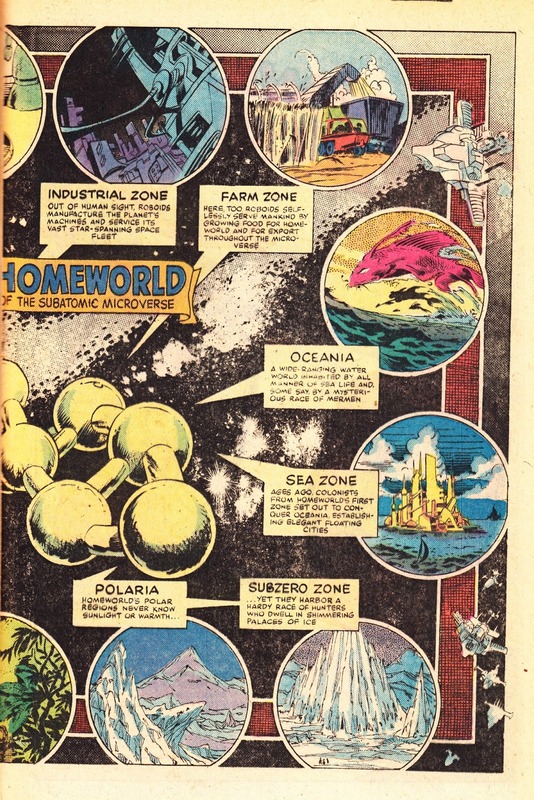 This bumper list of Starlogged-friendly stuff appeared in MARVEL ACTION issue 15 (cover-dated 8 July 1981). 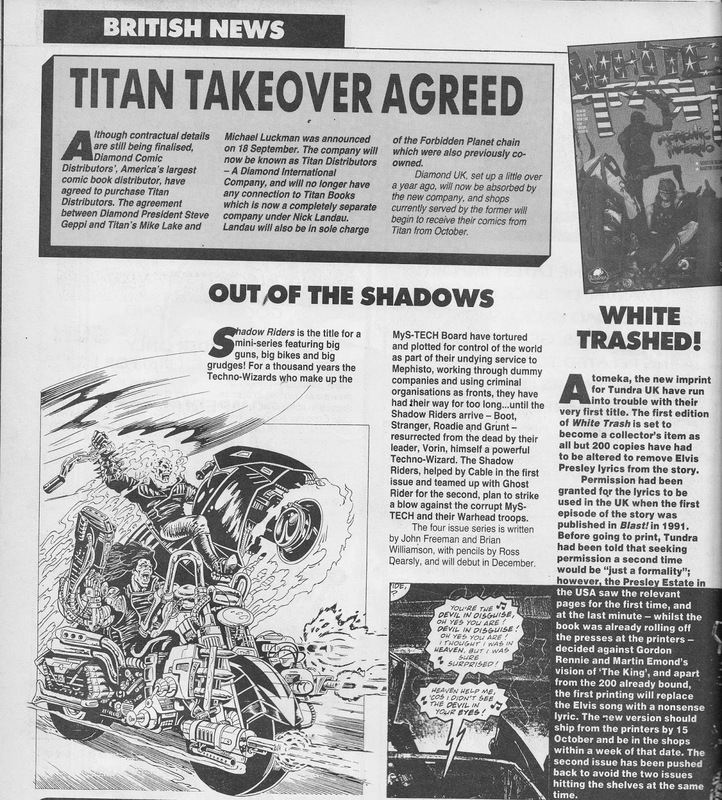 This is a news report from COMIC WORLD issue 9 (November 1992) heralding the imminent launch of MARVEL UK's new SHADOW RIDERS book. 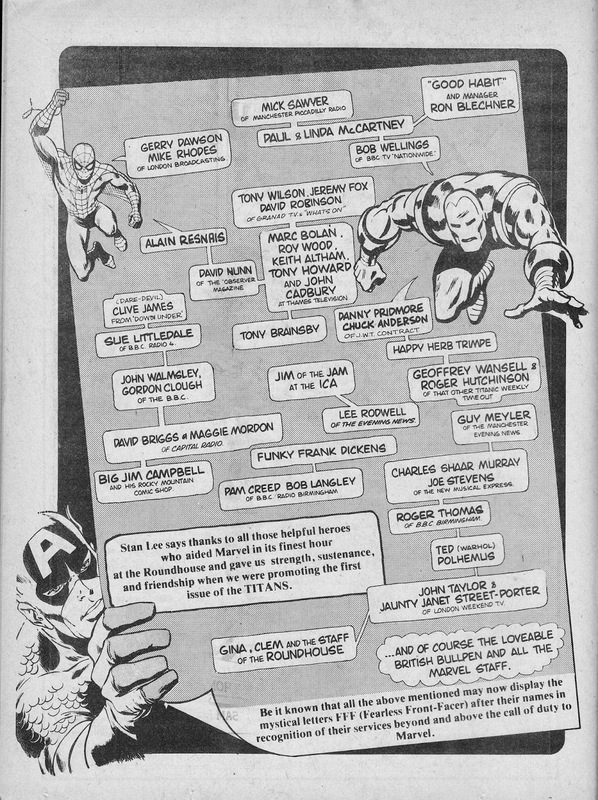 After Stan Lee's October 1975 visit to London and the UK, this page of "thank you" messages appeared in the British weeklies at the turn-of-the-year. 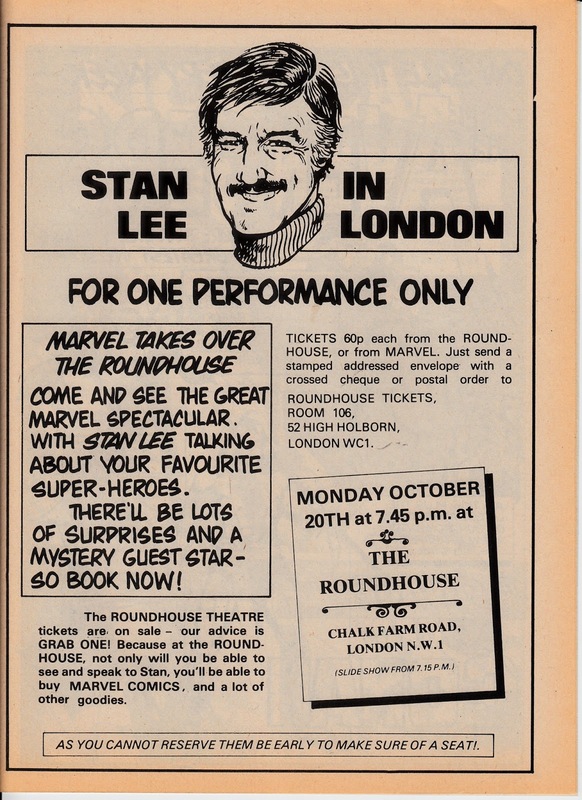 In October 1975, Merry ol' London Town went Marvel Mad! 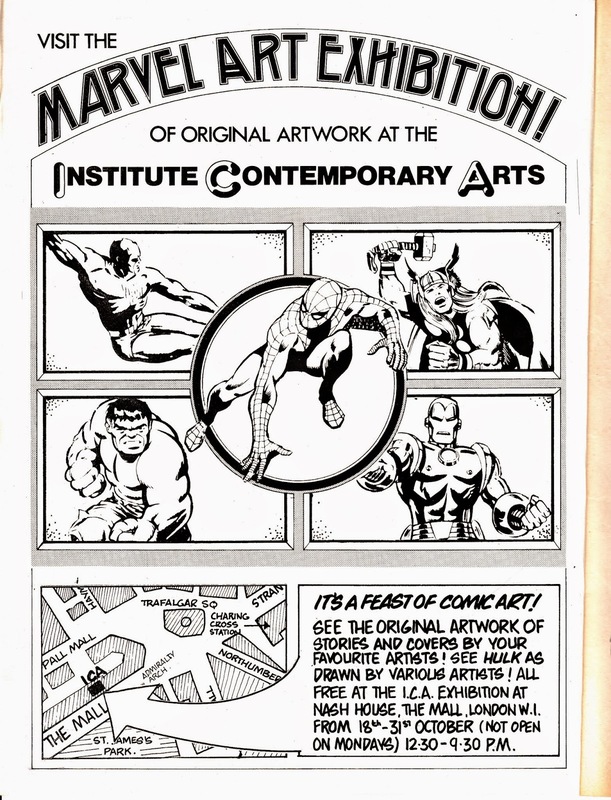 Not only were the ICA hosting an exhibition of original Marvel art but Stan himself was in town for one of his periodic trips across the Atlantic to spread the word of The Man (and plug, through numerous media appearances, the British weeklies). The centre-piece of the visit was a one-night-only talk (tickets a snip at 60p!) at Camden's Roundhouse. This is a seldom-seen colour one-shot (Conan was the other) published by MARVEL UK in 1982. 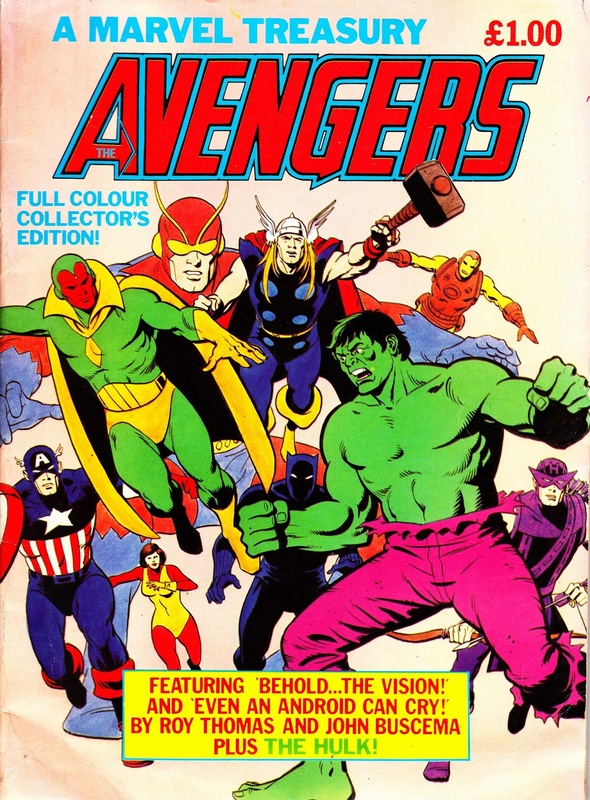 THE AVENGERS reprinted the Vision-centric US issues 57 and 58. Despite the banner text, this is magazine-sized rather than one of the seventies tabloid-proportioned monsters. 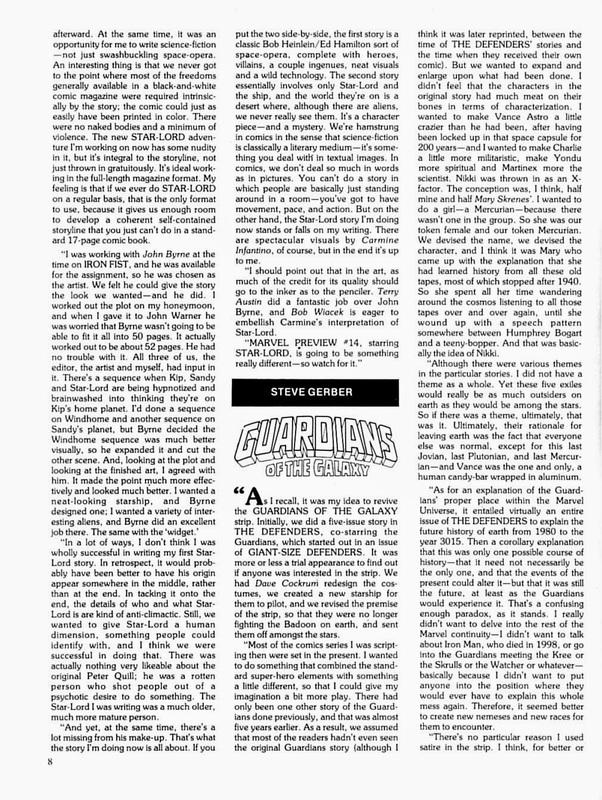 This was published in November 1989. I have no idea how long it ran. 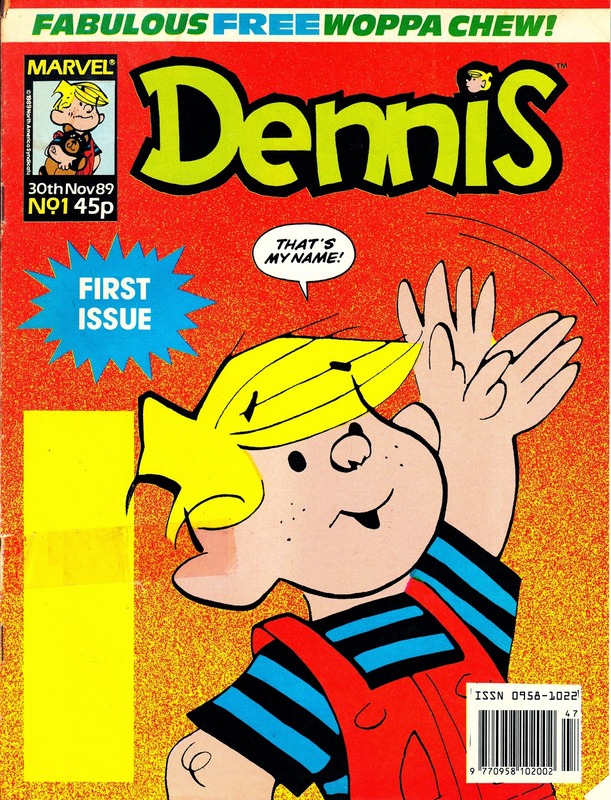 I'm sure the strips are US reprints, published under license. Sadly the Woppa Chew has long-since parted company with this copy. The Prince of Darkness was temporarily laid to rest following the demise of PLANET OF THE APES AND DRACULA LIVES when only the movie tie-in made the immediate leap into the pages of THE MIGHTY WORLD OF MARVEL. 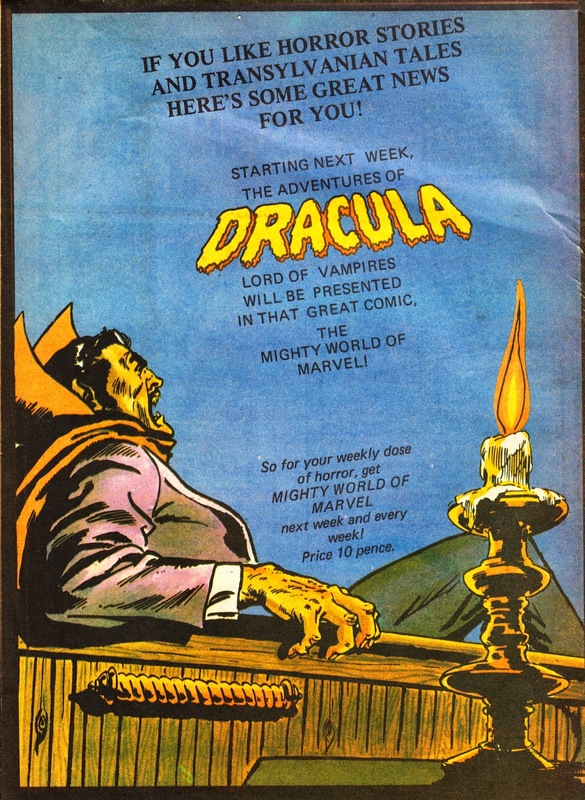 However, with the last of the US Apes strips exhausted (and the license running out), Tomb of Dracula reprints were belatedly used to plug the gap. Here's a House Ad from MWOM 15 June 1977 announcing his imminent resurrection. Here is an (exceptionally wordy) advert (from May 1978 and published in the MARVEL UK weeklies) plugging the Airfix SPACE: 1999 model kits. 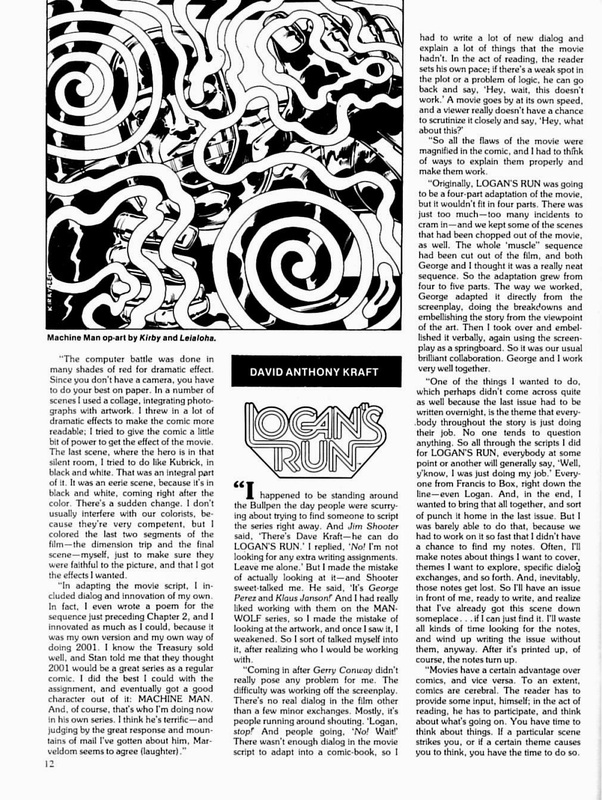 More foil-enhanced goodness from the dawn of the Modern Age of MARVEL UK (or, if you prefer, the last splutterings of the old business): the launch of the first issue of THE ESSENTIAL X-MEN. The other, along with Astonishing Spider-man, of the two original Collector's Edition launches. The range, under Panini's stewardship, has grown considerably since then. The X-Men CE is still going strong although it's been relaunched and renumbered several times since. The Modern Age of MARVEL UK starts here: the launch issue ASTONISHING SPIDER-MAN from November 1995… and the first (along with ESSENTIAL X-MEN, launched at the same time) of the current Collector's Edition format. 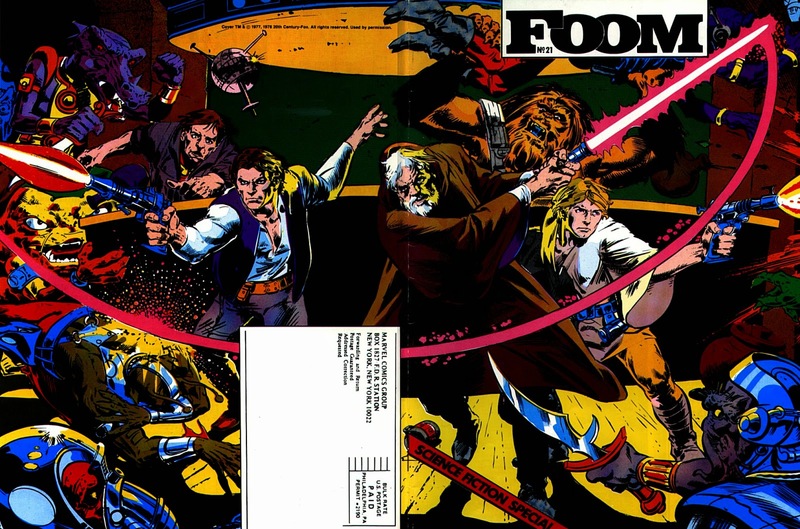 This first issue had a foil-enhanced card cover. 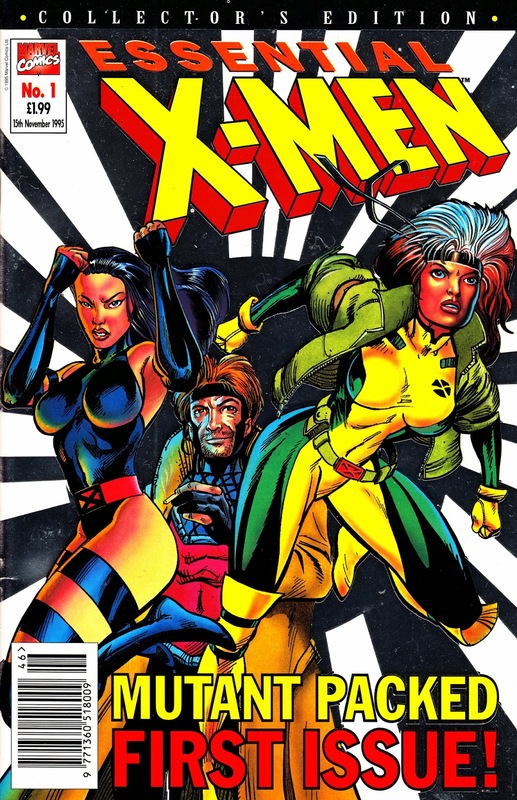 All of the Collector's Edition books have been rebooted and relaunched a number of times since, usually to coincide with the reprint of a major US storyline or event. This was still issued under the MARVEL UK banner, although the changeover to Panini Comics was imminent. 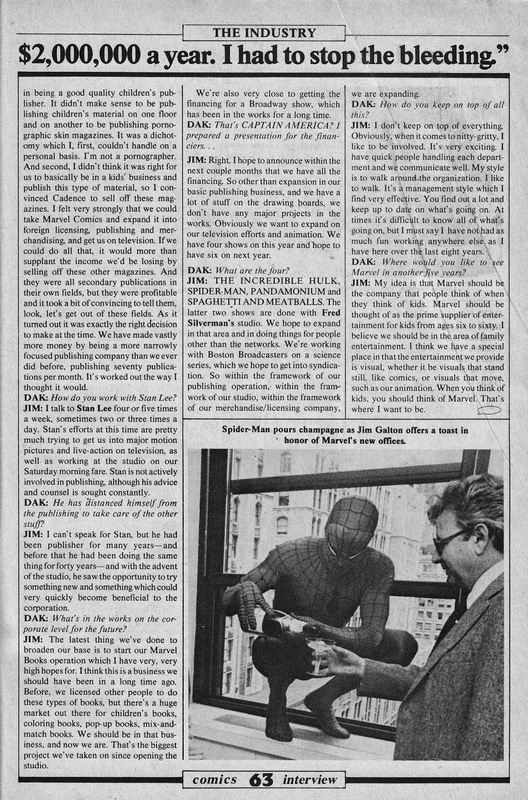 THE EXPLOITS OF SPIDER-MAN (21 October '92) picked-up where the THE COMPLETE SPIDER-MAN left off. It returned to the traditional A4(ish) proportions of a British comic. The reprints hailed from the US titles (vintage and modern) and also included MARVEL UK's own GENESIS 92 character Motormouth. These strips had already appeared (a few months earlier) in the pages of OVERKILL but the versions published herein were the full uncut versions, featuring the US pages deleted for the Overkill run. 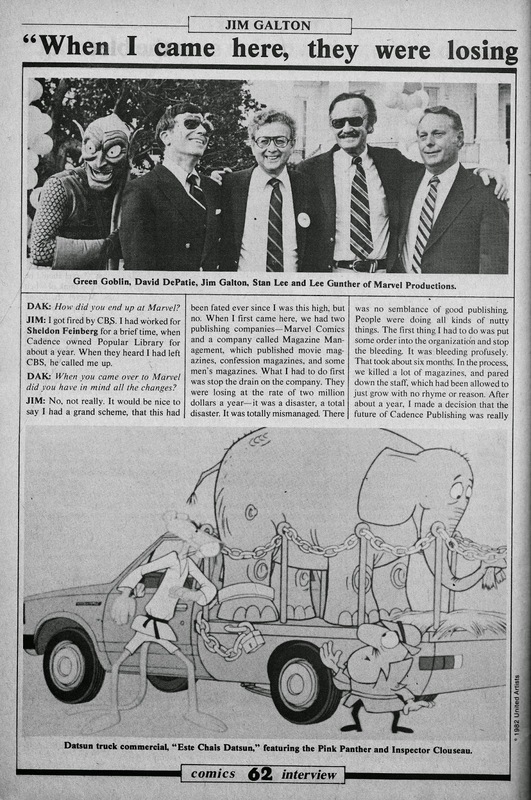 The Fantastic 400 gag-strip of old was revived, probably because Tim Quinn (one half of the original creative team) was at the helm. 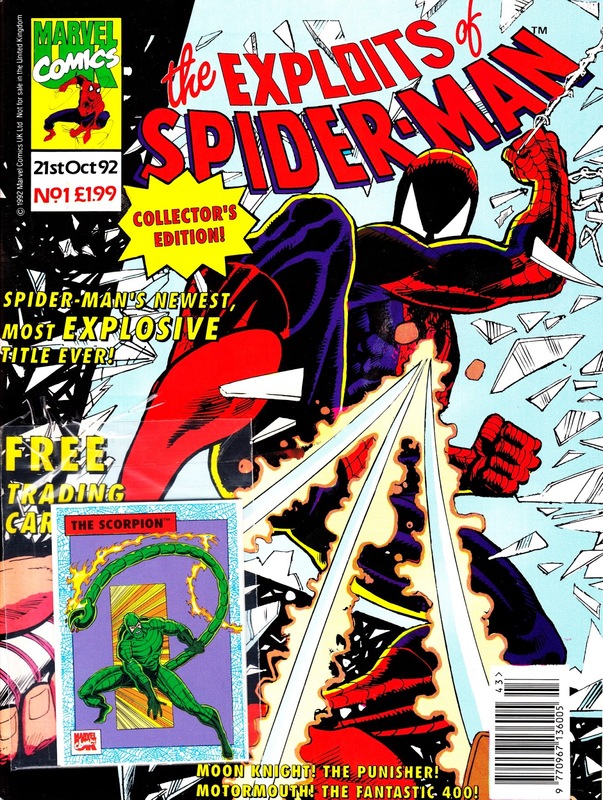 The free gift cover-mount on the first few issues were a set of Spider-man trading cards, produced exclusively for Exploits. 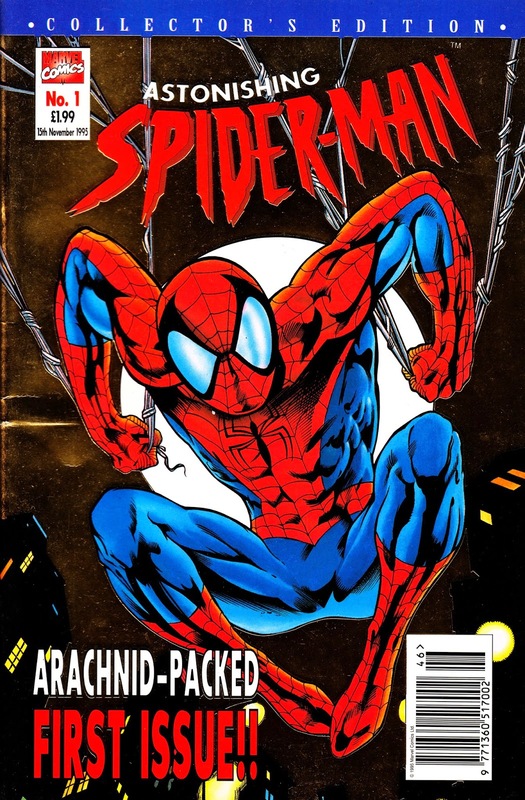 This was replaced by THE ASTONISHING SPIDER-MAN COLLECTORS EDITION in November 1995, the first of the modern CE titles and one of the final launches from MARVEL UK. 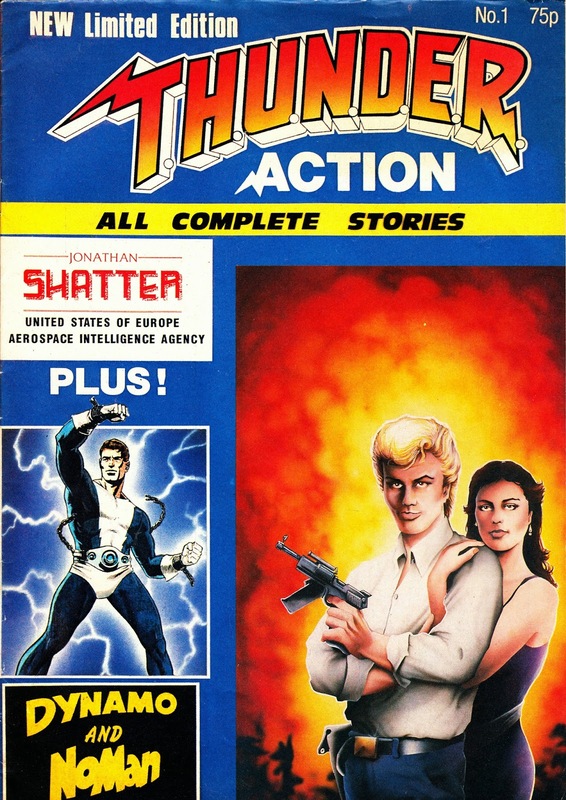 THUNDER ACTION issue 1 from 1986. I know very little about this other than it reprinted various T.H.U.N.D.E.R AGENTS strips (possibly licensed… or possibly deemed to have dropped into the public domain at this point) along with SHATTER which was hyped at the time as being the first computer-drawn comic book (but was actually pretty scrappy and unattractive despite the technological achievements). This ran for at least three issues and was published by an outfit called Savoy Services. It had newsagent distribution in the UK (I remember getting my copy from the local branch of Martins the Newsagent). Remember: Darth Vader won't be there when YOU cross the road! The first (?) 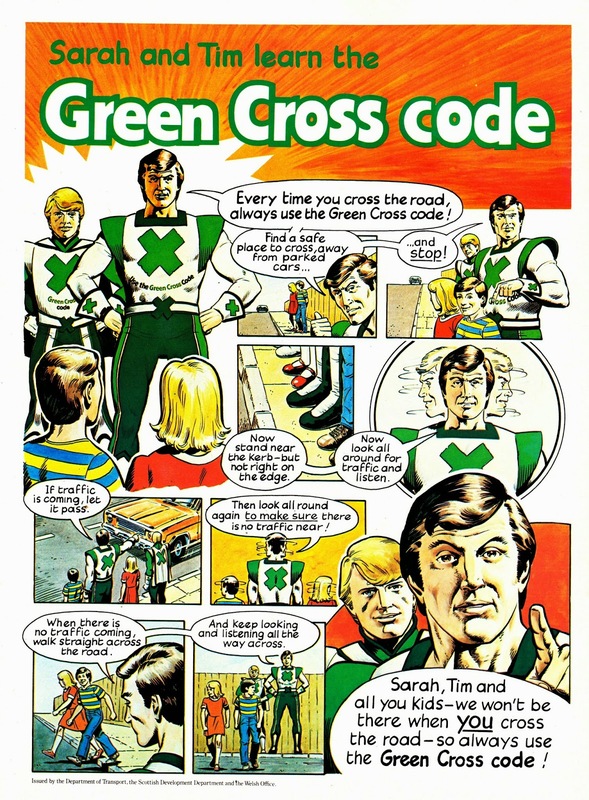 GREEN CROSS CODE print ad, part of the multi-media road safety campaign for kids, published in MARVEL UK titles in July 1978. 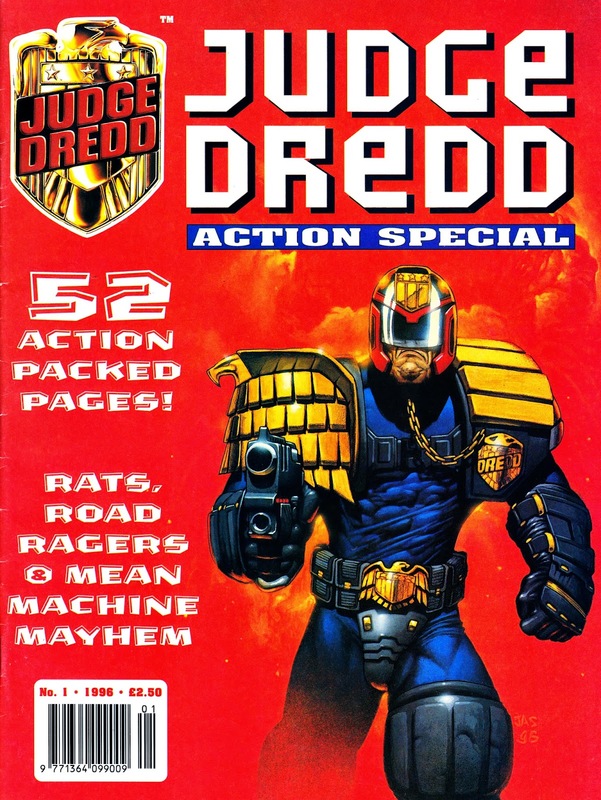 The JUDGE DREDD ACTION SPECIAL was a post-movie one-shot, published in 1996, spun-off from the initially popular (but, ultimately, short-lived) LAWMAN OF THE FUTURE fortnightly. 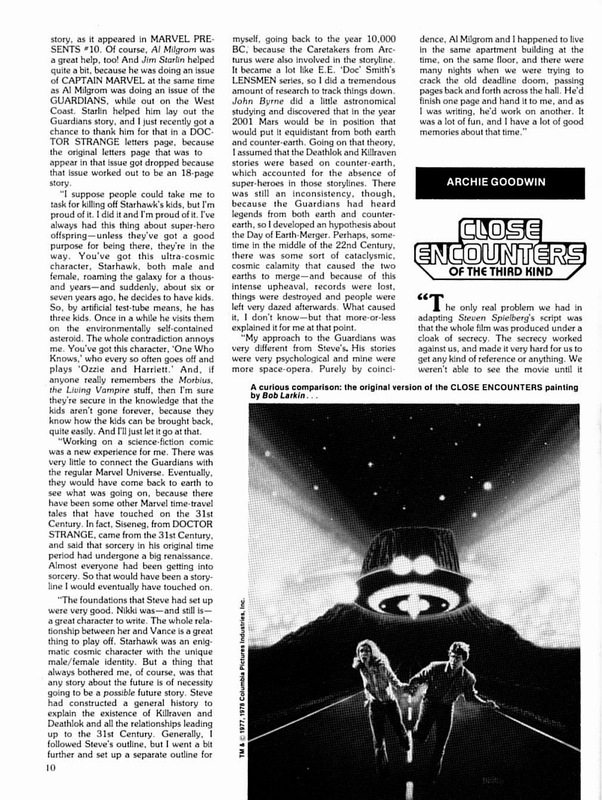 Like the main comic, this was pitched at a younger readership than 2000AD and the MEGAZINE but borrowed aspects of established JD lore and tarted them up for an audience more familiar with the character from the Stallone movie. 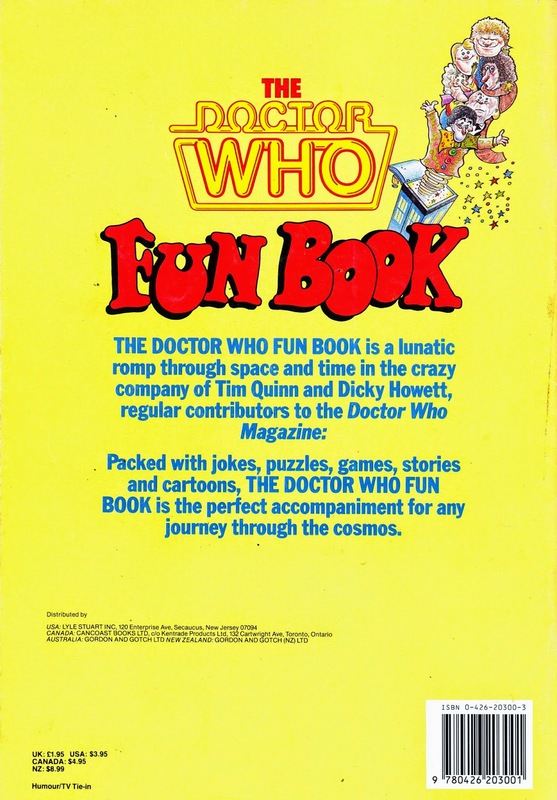 As far as I know, none of this material has ever been reprinted (although there were international editions aplenty of the LMOTF title so there may be other editions of this doing the rounds around the world). 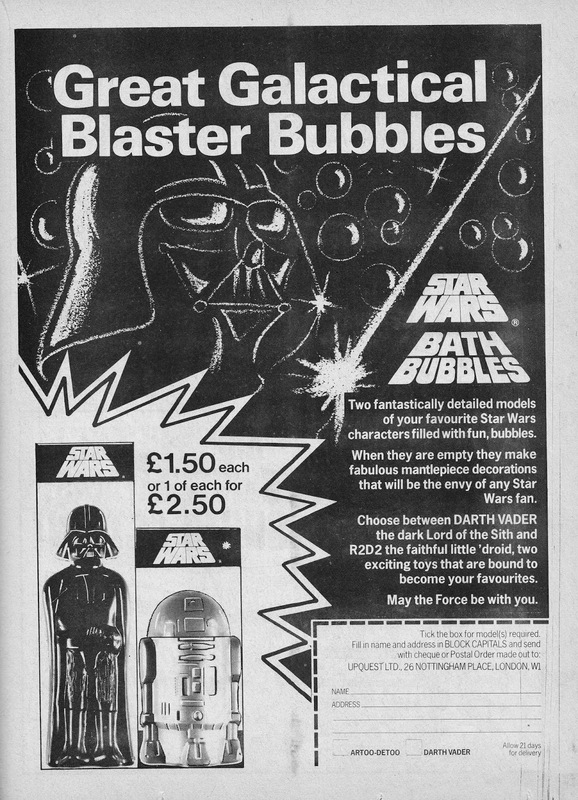 Did Darth like a bubble-tastic bath break? 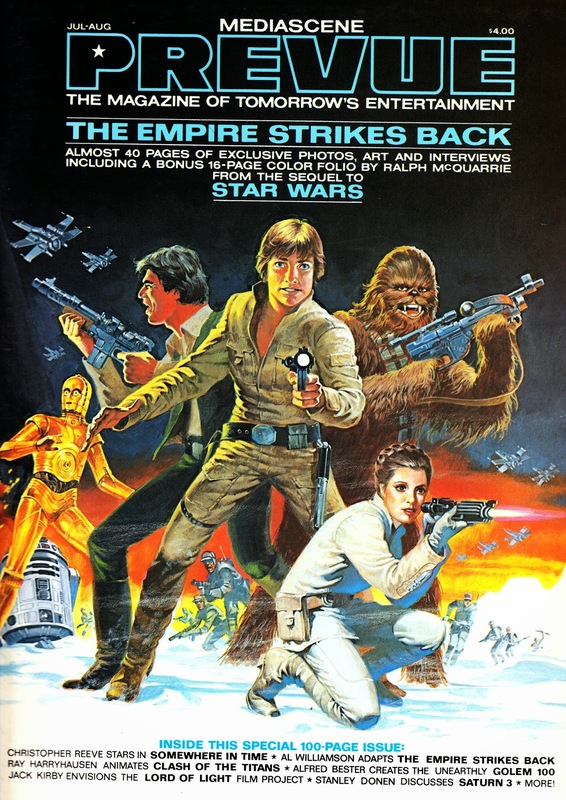 This STAR WARS ad appeared in June 1978. 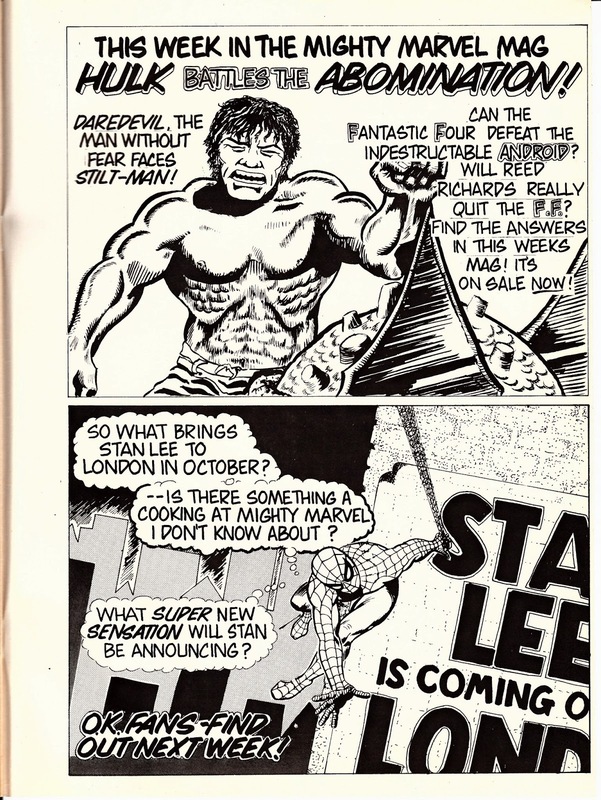 Published by MARVEL UK to coincide with the show's 25th anniversary (oh goodness, I feel old!) 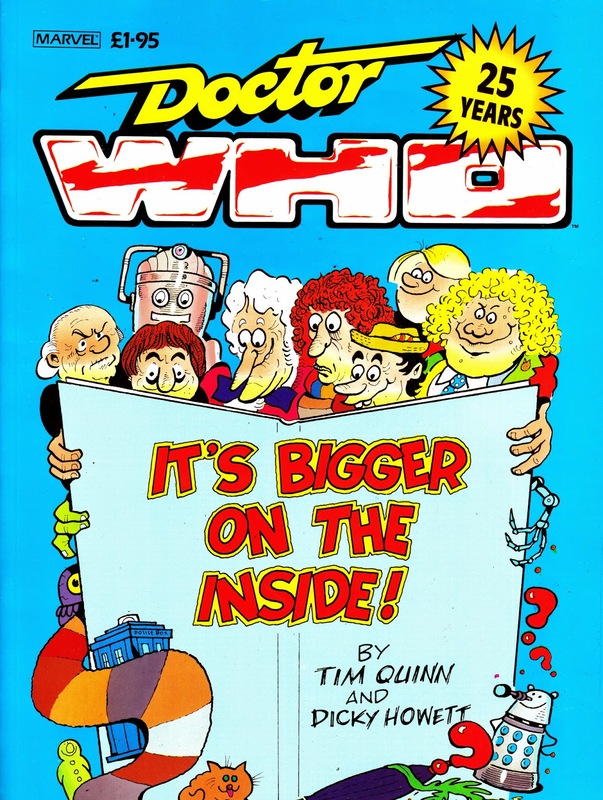 back in 1988, IT'S BIGGER ON THE INSIDE was the follow-up to 1987's THE DOCTOR WHO FUN BOOK (from Target Books). 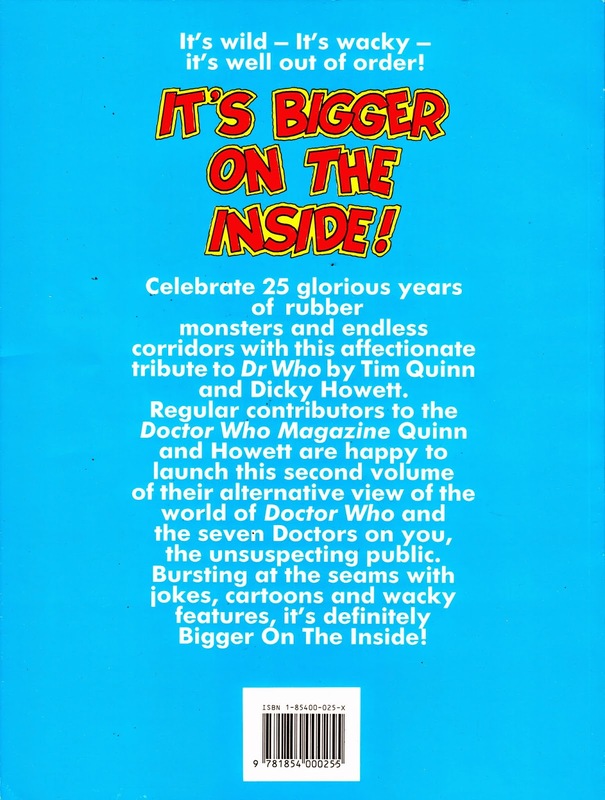 Once again, this was new material from Tim Quinn and Dicky Howett (Marvel UK's resident mirthsters since circa 1980). At the weekend I picked-up a new trade paperback, KINGS WATCH, which appears (because I've not actually read it yet) to be a revival of the old DEFENDERS OF THE EARTH concept in all-but-name. 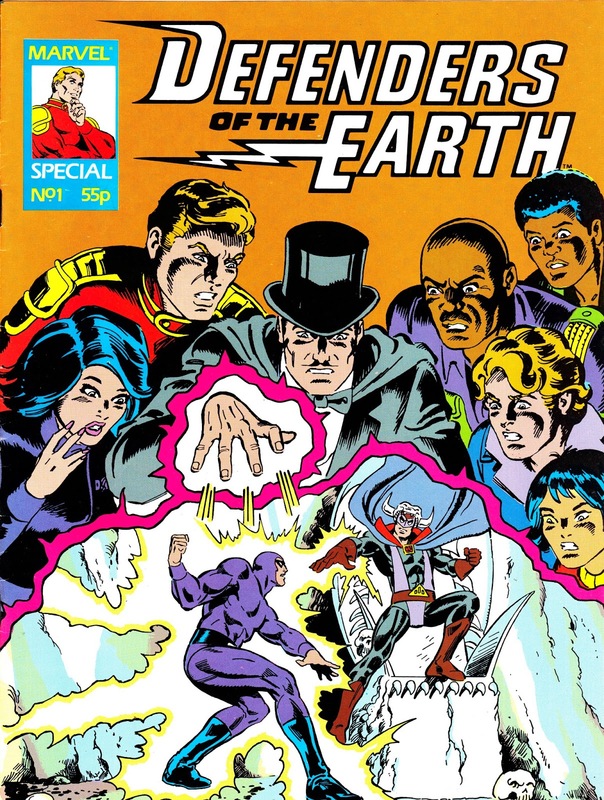 For the forgetful/ young, the Defenders (not to be confused with the multiple iterations of the Marvel team) were Flash Gordon, Mandrake the Magician, The Phantom and Lothar. The thing they all had in common, other than being faded stars of newspaper strips, was that they were all characters owned by King Features Syndicate. Back in the eighties, KFS and Marvel Productions teamed-up to bring the characters back to TV in a new 65-episode daily animated series (which enjoyed numerous runs on the BBC in the UK). In an attempt to make the somewhat old-fashioned characters more palatable to a modern audience, Marvel stacked the show with an unfeasibly large cast of offspring for the various main characters who, in addition to adventuring, also became educational parental figures. Defenders was accompanied by a large merchandising push, including figures and vehicles, but never really caught fire with consumers. 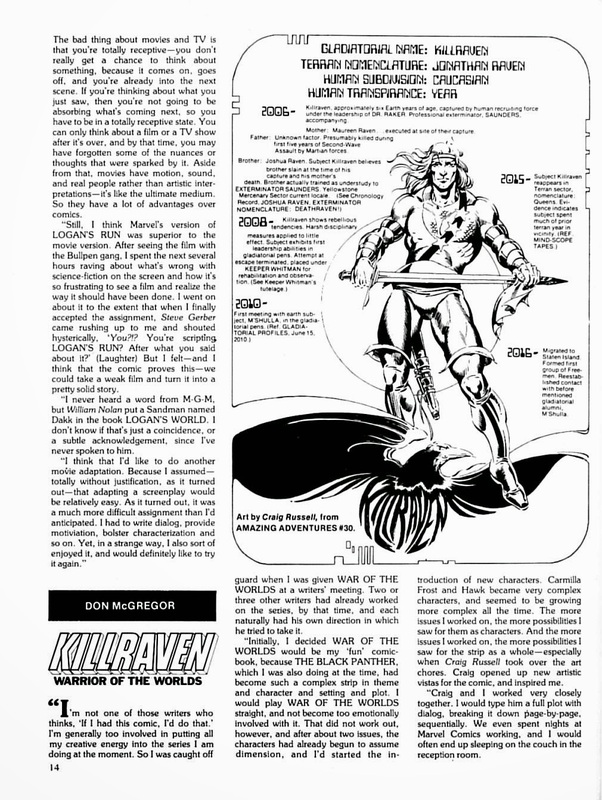 Marvel, obligingly, launched a comic book version under the Star Comics imprint. 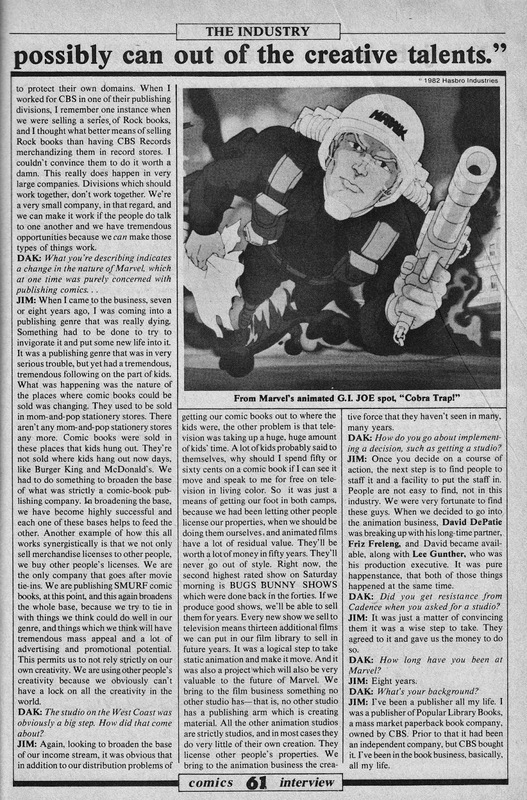 Unfortunately, the line suffered a contraction and several titles, including DOTE, were canned suddenly (the toy/ animation tie-in THE INHUMANOIDS expired at the same time, forcing the reprints in Marvel UK's THE TRANSFORMERS to end without wrapping-up the plot). The fourth issue was the last. 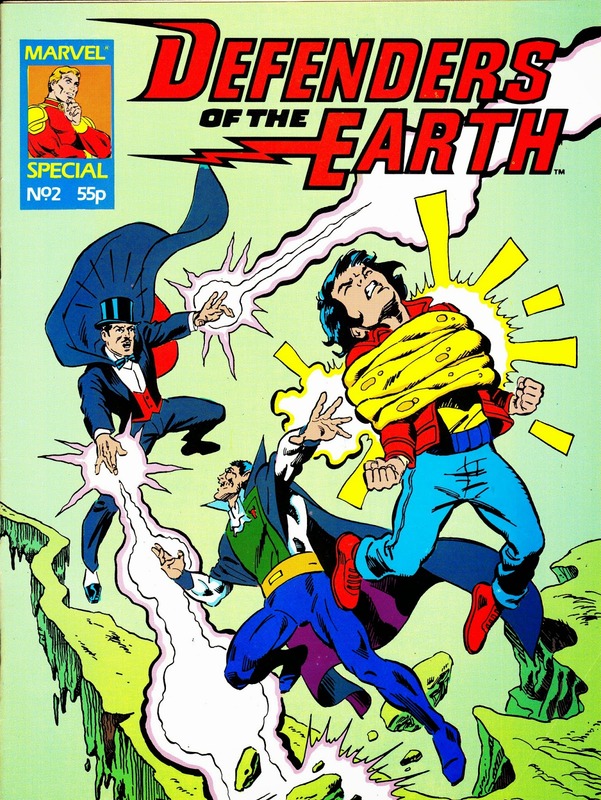 The first two US issues, which adapted the show's opening episodes (the Marvel version explicitly establishes that the soon-to-die wife of Flash Gordon is indeed Dale Arden, the screen version is much more coy and never names her for some reason) appeared OVER here in a MARVEL UK annual. 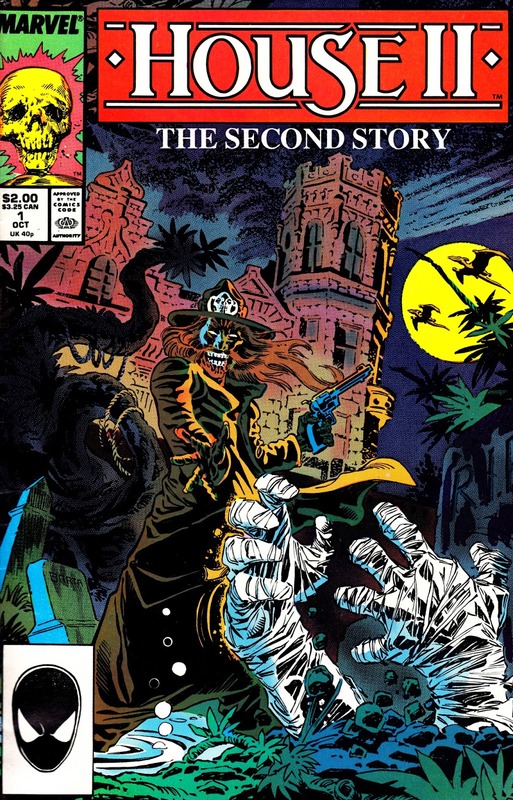 These two specials, both from 1988, reprinted the third and fourth issues of the US series. 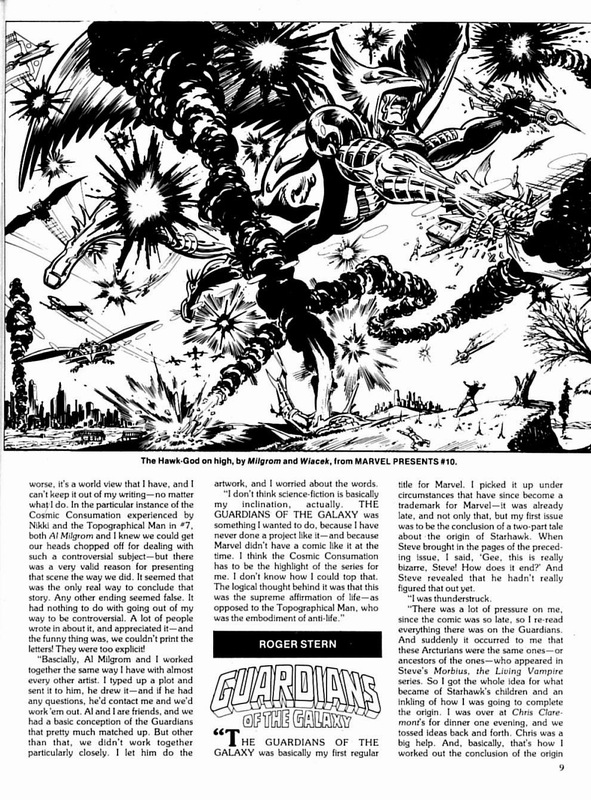 The Defenders strips were also serialised in THE MARVEL BUMPER COMIC. 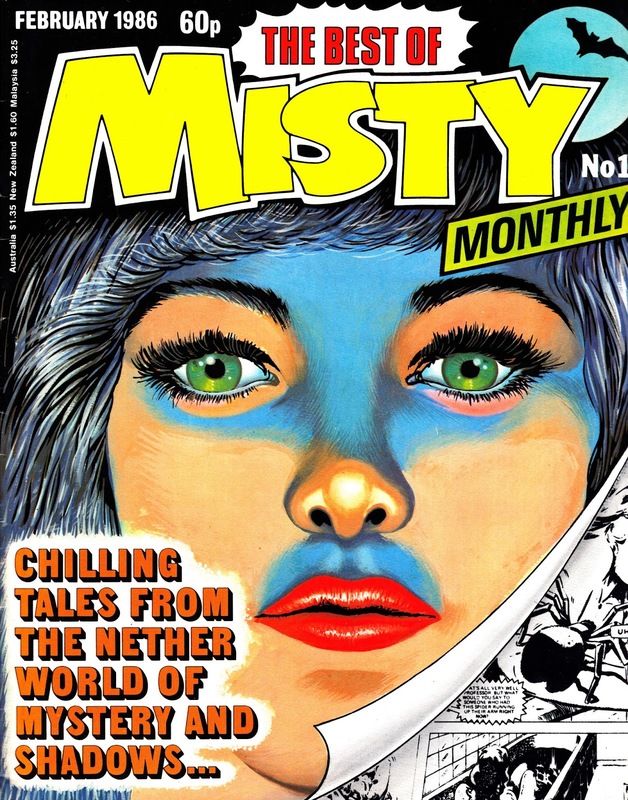 THE BEST OF MISTY was another entry into IPC's range of back-catalogue scouring "Best of" black & white monthlies and launched in early 1986. Like the others in the series, it compiled stories from the weekly. Unusually, these compilations hailed from a long-defunct title. IPC had folded the cult classic supernatural girls comic into TAMMY (ahem) way back in January 1980 after a run of 101 issues over just under two years. The "Best Of" line was somewhat hit-and-miss in terms of success. 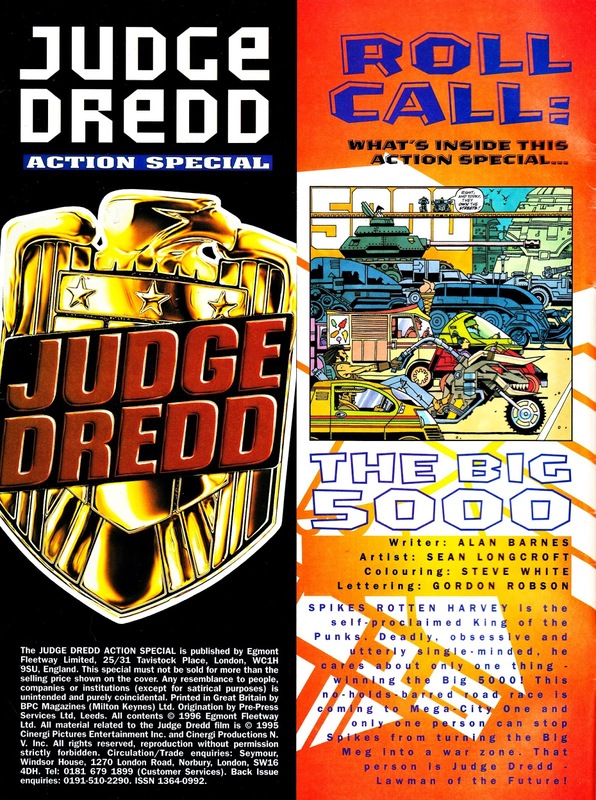 The 2000AD spin-off, launched the previous year, was a runaway success (despite the sheer number of other 2000AD reprints doing the rounds at the time) and eventually ran for a decade before being relaunched to coincide with the 1995 JUDGE DREDD movie. 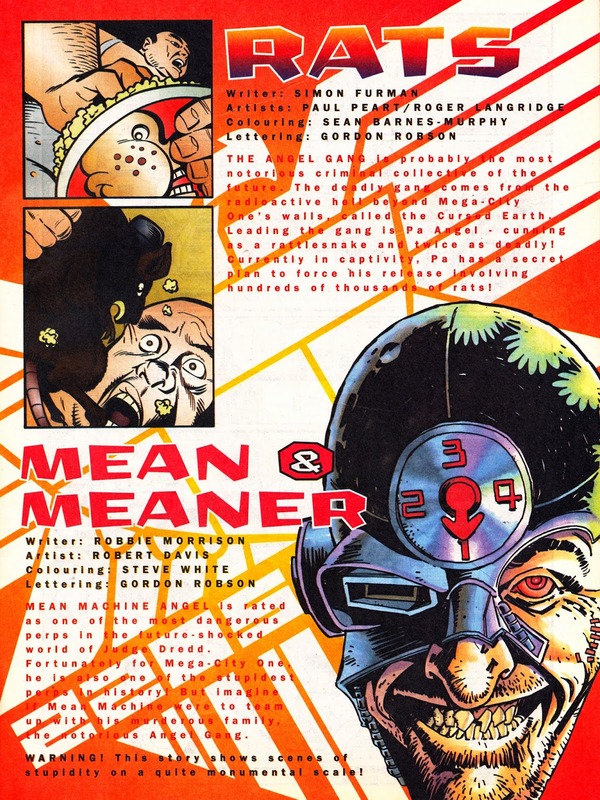 It even managed to spawn a spin-off of its own when the Dredd strips were split off into their own title. 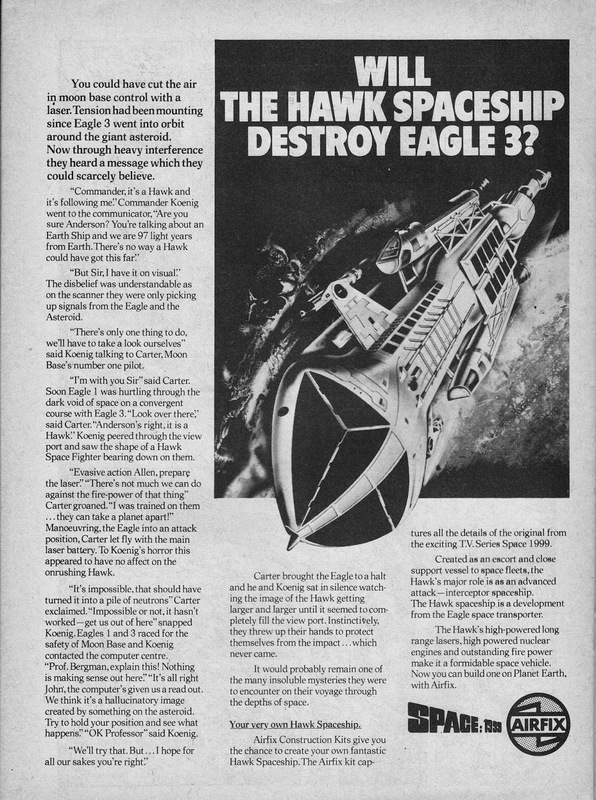 At the other end of the spectrum, the EAGLE spin-off proved to be a flop desperate being attached to IPC's 1980s mainstay (the list of other titles it absorbed is depressingly long: SCREAM, TIGER, BATTLE, MASK and WILDCAT), and pulling reprints from TIGER and SCREAM, it failed to find a readership. These represented a low investment/ high return prospect for the publisher… they didn't have to pay to reprint their own inventory and the work-for-hire creators weren't entitled to supplementary payments for reuse of material. 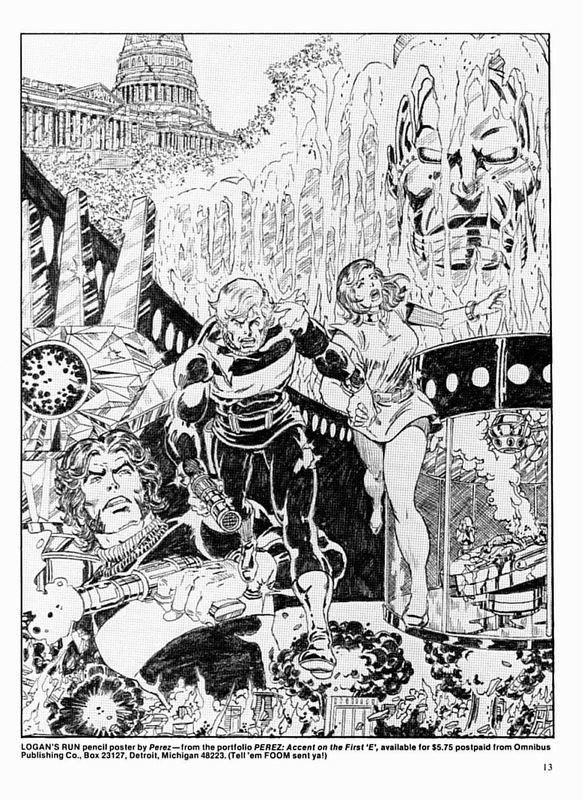 This was another test-the-water one-shot, published by MARVEL UK in late 1980. It must have been deemed a sufficient success (possibly thanks to the amazing cover art) to return the next year as (the inappropriately named) BLOCKBUSTER resurfaced as a monthly with Omega, The Inhumans and Iron Fist. With a line-up like that, it's no wonder it didn't last the year. Thor didn't reprise his slot for the ongoing series, presumably because he was already booked into VALOUR… followed by MARVEL ACTION and, before the end of the year, CAPTAIN AMERICA. He finally graduated to his own solo weekly, the first to appear with colour interiors, in 1983. Manga were a spin-off of the VHS/ distribution company of the same name who, if my memory is correct, had expanded into publishing by taking over Dark House International's Manga title when they withdrew from the UK market. 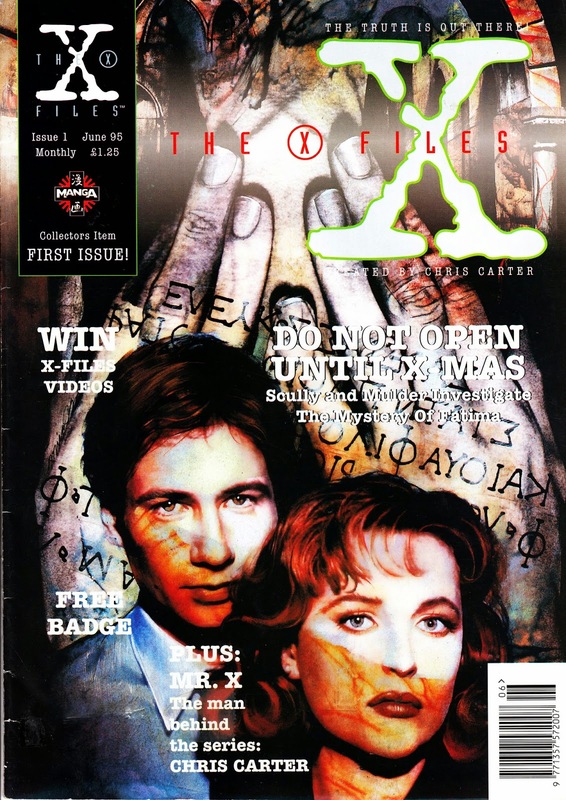 They got (exceptionally) lucky in 1995 by picking-up the UK comics rights to THE X-FILES just as it was exploding into the zeitgeist. 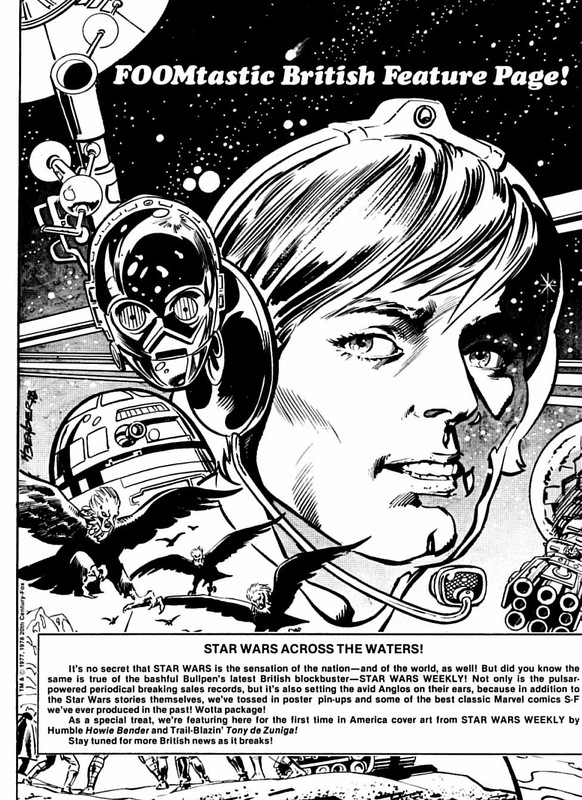 The main contents were lifted from the US Topps Comics tie-in, supplemented by newly originated text features. 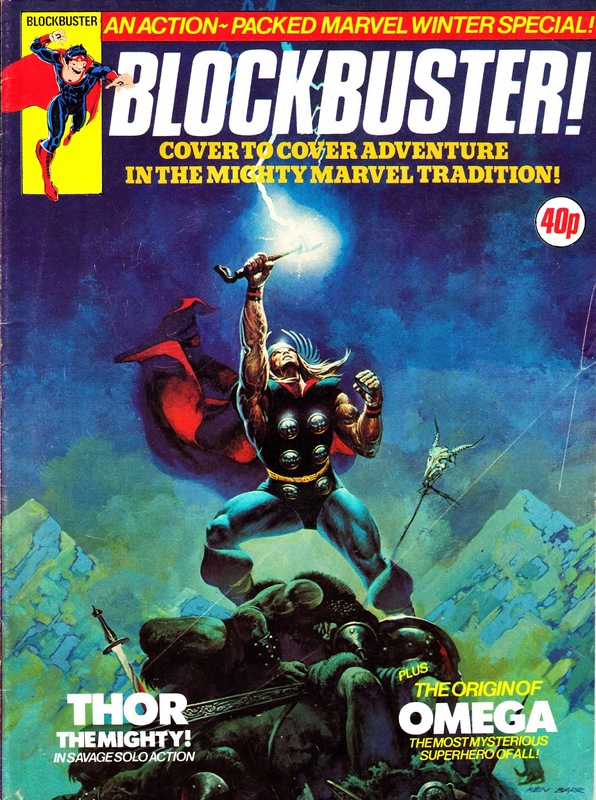 I wasn't a regular reader of this (but I have acquired the hardback compilations of the main Topps run) at the time but I believe Titan eventually took over the rights and, partly because Topps were beginning to struggle and the flow of new material was starting to dry up, rebooted it as a magazine. This first issue came with a free cover-mounted metal pin badge (long since lost unfortunately). 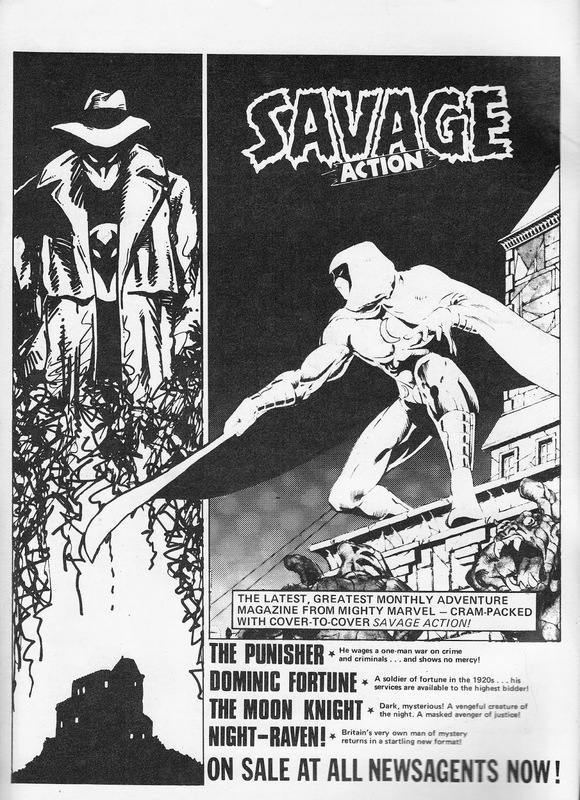 A mean'n'moody November 1980 MARVEL UK House Ad for the monthly SAVAGE ACTION. 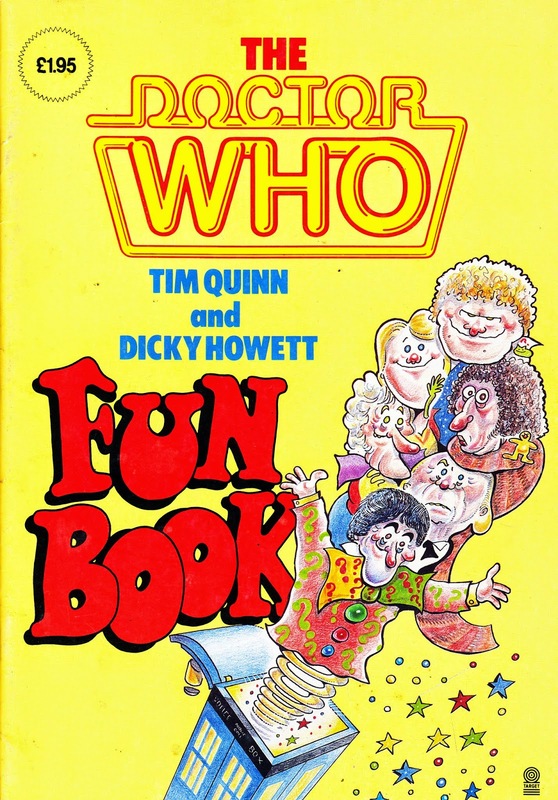 The DOCTOR WHO FUN BOOK, by MARVEL UK mainstays Quinn and Howett, published by Target Books in 1987. The sequel was published by M-UK for the 25th anniversary. The Marvel Mandarins try and keep their New World paymasters happy (and demonstrate some synergy) with this 1987 adaptation of the low-budget horror-comedy HOUSE II: THE SECOND STORY. 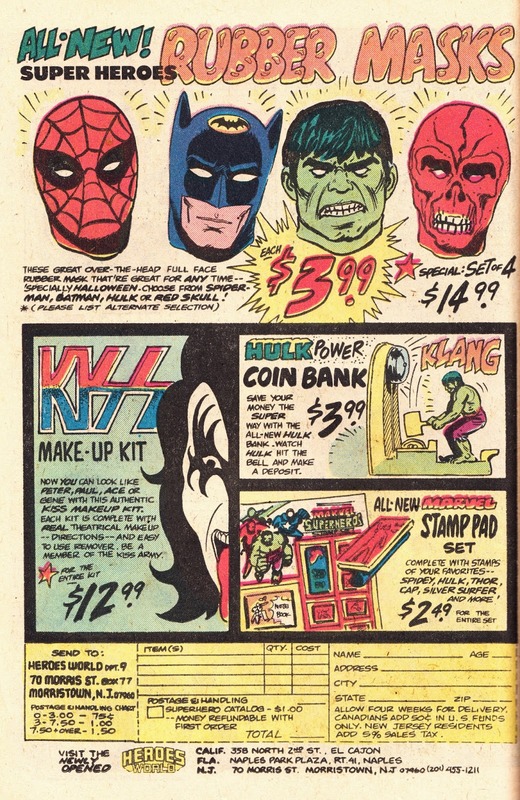 Here's something ideal for fetish fans and comic book junkies: rubber masks based on comic book characters… plus other assorted late-seventies (this US ad hails from 1979) tosh including KISS Make-Up. Whot's not to love? 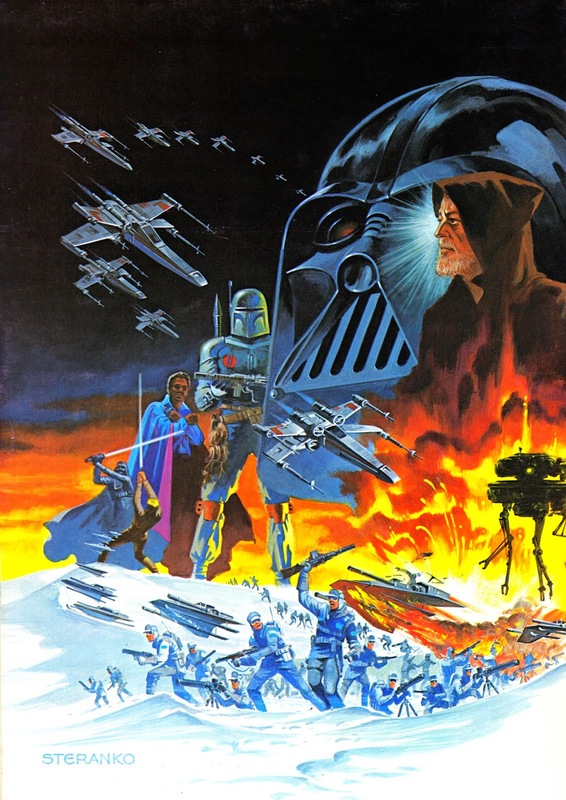 From the summer of 1980: two stunning pieces of Jim Steranko EMPIRE STRIKES BACK art from the front and rear covers of his MEDIASCENE PREVUE magazine. This is either issue 41 of MEDIASCENE… or the first issue of MEDIASCENE PREVUE… it's running a dual numbering system inside. Previously a newspaper-esque tabloid, this was (I believe) the first issue to appear in a traditional magazine format. Apparently, over time, the quotient of scantily-clad ladies significantly increased. 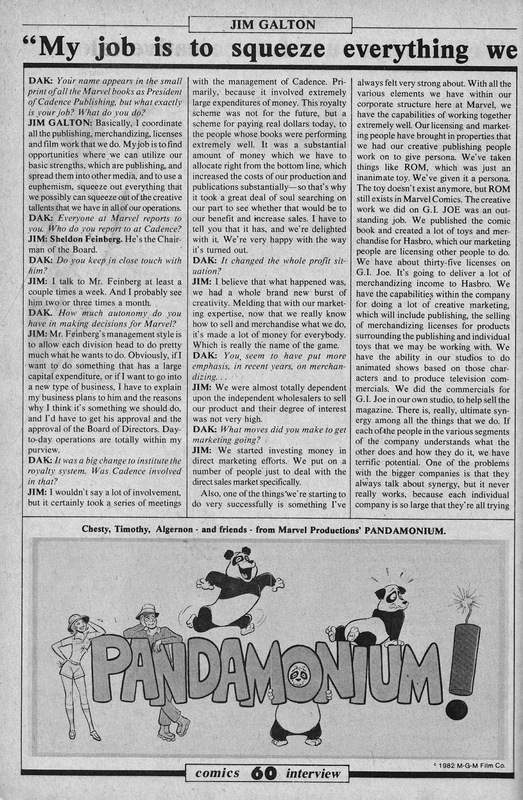 This is another great interview from the first issue (February 1983) of the long-running (150 issues!) 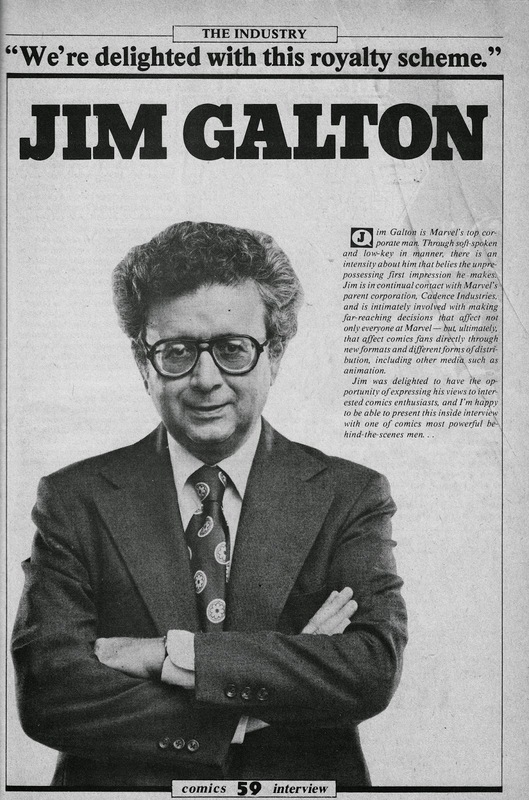 COMICS INTERVIEW: Jim Galton, the big man at Marvel. 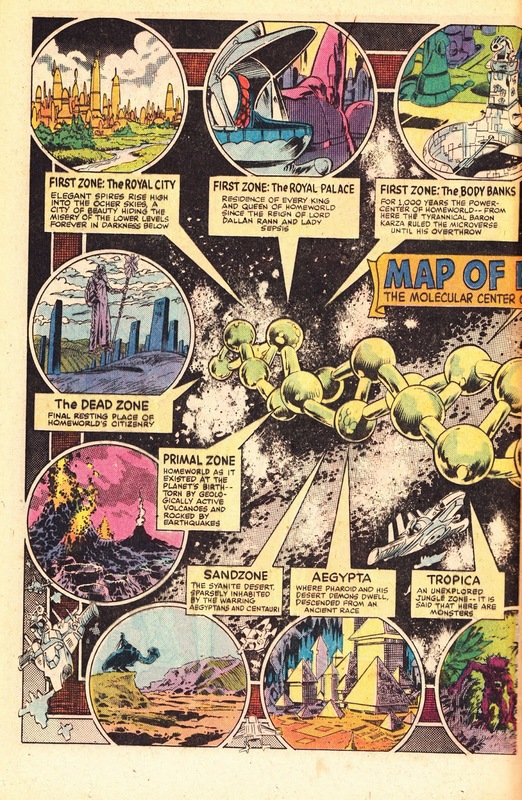 This is a handy-dandy map of the MICRONAUTS Homeworld, published in issue 24, December 1980. 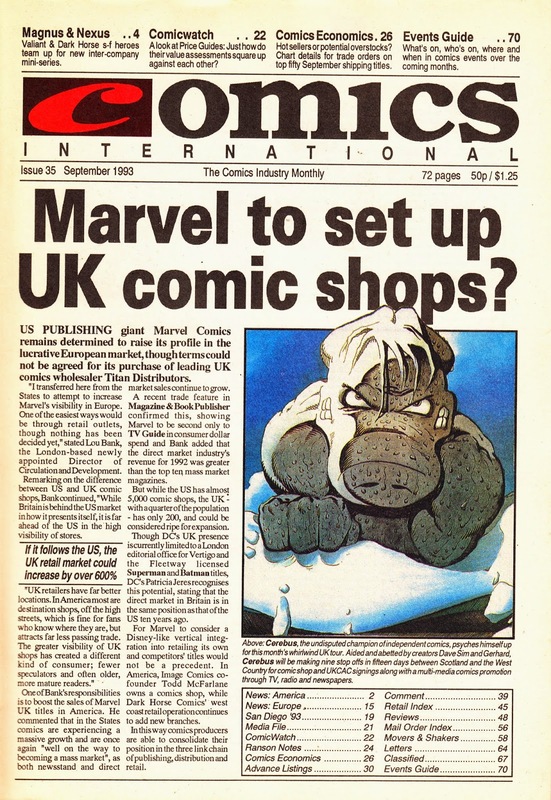 Here's something that never came to pass… but, for a while during the boom of the 1990s, did look like a genuine possibility: Marvel (who were busy expanding in every direction it could… something it would come to regret a few years later when the debts had to be paid) getting into retail. Lou Bank briefly popped-up at MARVEL UK just as the bottom was falling out of the industry. The same month, the Annex of Ideas announced another raft of new launches (see here), only to cancel or curtail the bulk of them before they went to the printers. Within a couple of months, Marvel's British operation was dramatically scaled-back and Bank went back to the States. 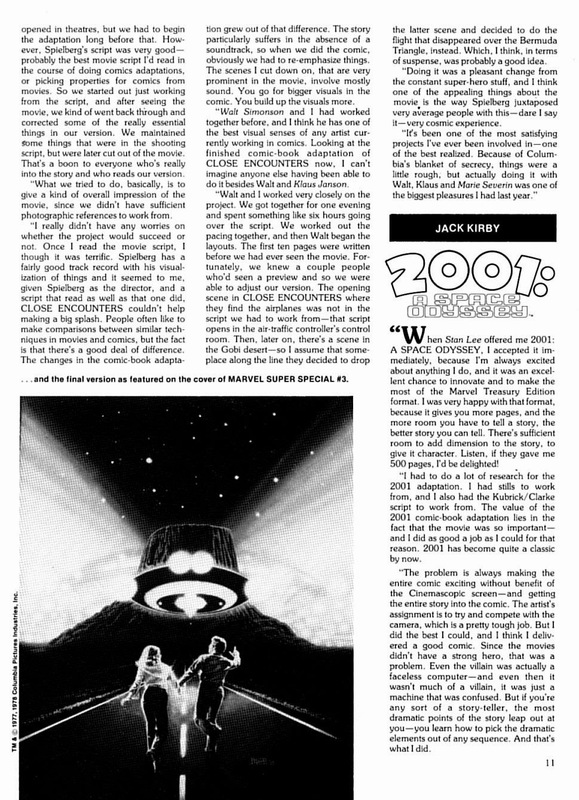 Marvel never opened their own shops… but they did buy their own distributor, Heroes World, in the dying days of 1994. That proved to be an expensive disaster for Marvel and inadvertently triggered the consolidation in the industry that left Diamond as last-man-standing. Marvel shuttered the business in 1997 and returned to Diamond. 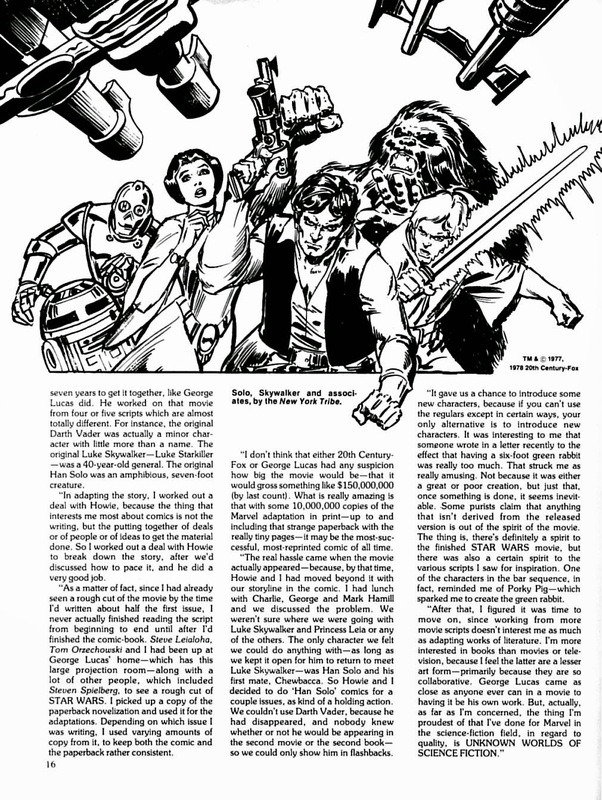 Cracking open the F.O.O.M Files (Friends Of Ol' Marvel, of course) again, here's some pages from the 21st issue, published in Spring 1978, which perfectly captures the post-STAR WARS "Star Age" boom: a starship full of Marvel SF comics. 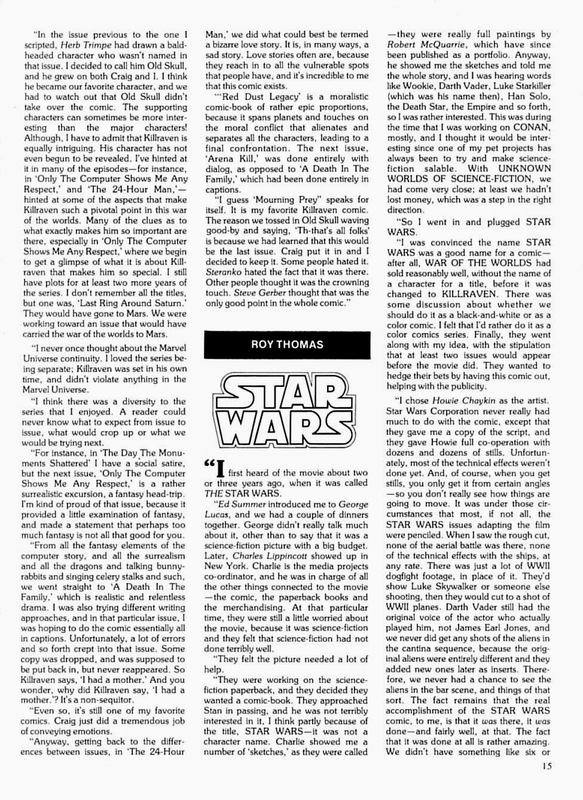 Many of these will be familiar to British readers of STAR WARS WEEKLY and FUTURE TENSE as many of the strips were convenient page-fillers, especially for SWW which was always desperate for new space adventure material to compensate for a lack of SW material. Indeed, I wonder if the US Bullpen was commissioning copious amounts of this stuff with one eye on feeding the British weekly as well as capitalising on the boom in the States. 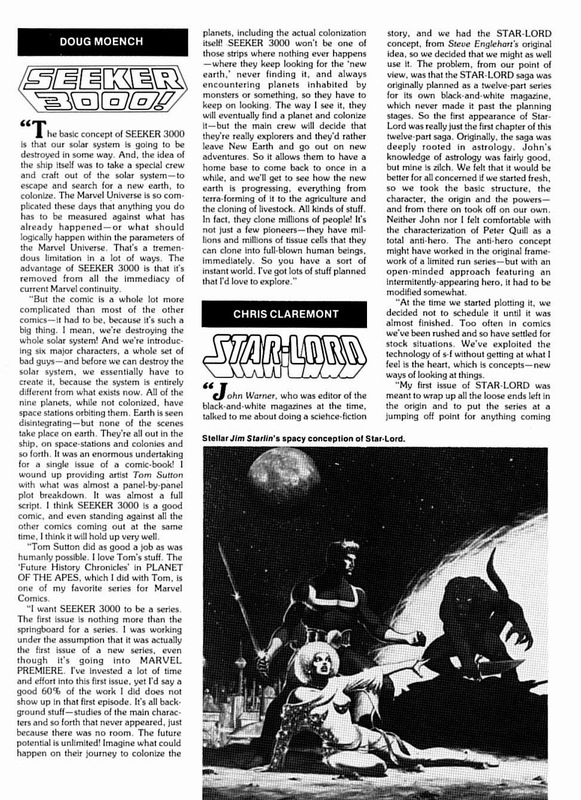 STAR-LORD and GUARDIANS OF THE GALAXY both feature… I doubt anyone at Marvel dreamed they would be the subject of a mega-grossing movie more than 35 years later. 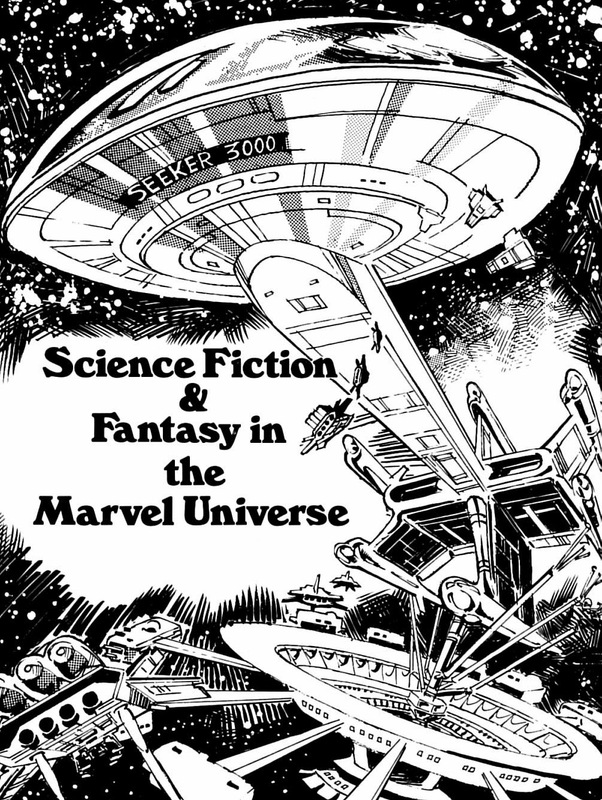 Marvel's commitment to all things SF actually grew, albeit through licensed properties, with the addition of the likes of ROM, THE MICRONAUTS, BATTLESTAR GALACTICA and STAR TREK to the monthly roster. I'm not sure of the identity of the cover artist (I don't think Marvel used this piece anywhere else… which is a shame), the piece is credited only to The New York Tribe. The final page posted was a regular feature devoted to the activities of the British Bullpen. At some point, in the near future, I'll start posting those as - occasionally - they give a fascinating insight into what-might-have-been. This was the penultimate F.O.O.M outing. 1993: THE MARVEL UK TITLES THAT NEVER WERE.